I watched Lonni vigorously knead the dough in her cheerful, homey family kitchen. As I observed her adept handiwork, I remembered as a young girl how I loved to watch my grandmother bake and I especially loved her workmanlike hands. Unlike my grandmother Annie’s thick, short fingers, Lonni’s hands are nimble and athletic, just like the rest of her tiny but powerful body. And unlike Lonni’s spacious modern kitchen, Annie kneaded and shaped her challah dough in her postage-stamp Brooklyn kitchen. 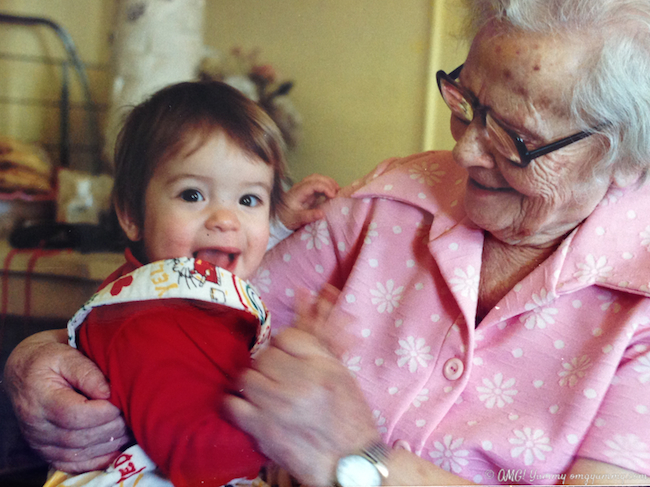 My grandmother Annie with her first great grandchild, holding her with her wonderfully pudgy beautiful hands. In a perfect world, one of Annie’s six children would have carried on the baking tradition and then passed it on to me, in all of its floury detail. Instead, they learned to make jello molds and all the “yummy” creations of the 1950s and 60s. 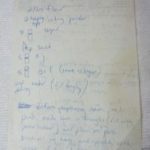 So as a very young girl, I tried to watch and write down my grandmother’s recipe without the aid of digital cameras or any proper recording device. 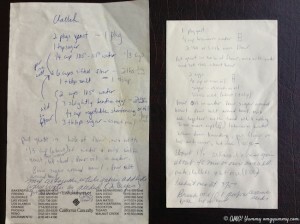 I ended up with nearly useless notes and pencil sketches of her measurements. And that is how I ended up in Lonni’s kitchen watching her knead dough. As a confident savory cook and occasional quick bread and rugelach baker, you’d expect my fear of yeast to have dissipated. Instead, like bad bacteria, it has festered and grown larger than it deserves to be. Lonni offered to help me rid myself of this lingering fear with a hands-on lesson. I came armed with all the right recording devices this time – an iPhone and a fancy point and shoot. But really, cooking and especially baking is not a spectator sport. You have to get in on the action. Feel the dough’s elasticity, moisture, texture and see its color, size, and shape. Because breadmaking is both a science and an art. If it’s a hot day, the dough might rise faster. If it’s a moist day, perhaps you’ll need more flour or less water. The recipe is the starting point; your senses are the tools that make the recipe become bread. Lonni chooses to knead the dough by hand. It’s a form of therapy and some really good exercise. She explains it in her recipe: “It takes me about 20 minutes to knead the dough by hand. I used to do it in the mixer, but I really like to feel the dough and put my heart (and muscle) into the process by kneading it myself!” Out of necessity, Annie also kneaded by hand. She had no stand mixer or food processor – kneading by hand was all she ever knew. And she did it that way into her 90’s, until her strength was just not there anymore. 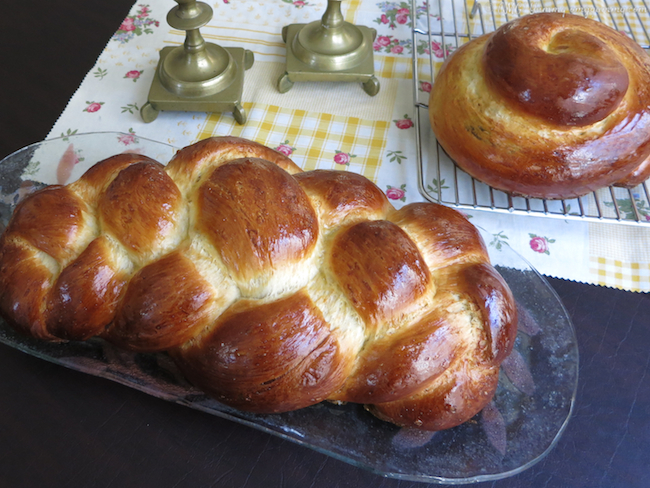 So it is with great appreciation to Lonni and her bread-baking prowess, that I share Lonni’s challah recipe (and three videos of her handiwork below the recipe) It may not be identical in content to my grandmother’s (though it is quite close! ), but if you believe that love is what really makes food taste wonderful, then it is every bit as perfect as Annie’s. Sweet round challah is the traditional food for ushering in the Jewish New Year. May 5775 bring us all, whether you celebrate or not, many happy hours at the dining room table and in the kitchen, where the best memories are always cooked up. 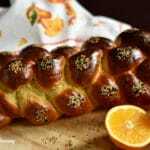 Similar to my grandmother's in both content and style, this is my dear friend, Lonni's tried and true recipe for challah. You can make it plain, with sesame or poppy seeds, or filled with cinnamon sugar. 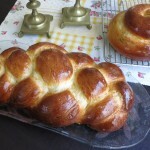 Braided for any shabbat or round for a sweet Rosh Hashanah. Knead until smooth and shiny and springy. It takes me about 20 minutes to knead the dough by hand. I used to do it in the mixer, but I really like to feel the dough and put my heart (and muscle) into the process by kneading it myself! Cover and let rise until double in size. The time varies by the weather. You can also do this the night before and let rise in the fridge overnight. Turn the dough out onto the counter and divide in half. Braid, or shape as you wish. I like to add cinnamon and sugar. Place prepared loaves on a lightly oiled baking sheet (I use silpat mat). Let rise 1 hour in a warm place. It is important not to let the second rise go much longer than an hour. After that the yeast begins to die and your challah will be flat and taste "yeasty"
Brush the loaves with egg. Bake for 20-30 minutes until golden and the loaf sounds hollow when thumped. Remove immediately to a wire rack so the loaves don't get soggy on the bottom. I wish we could cook together too Laura. It’s something that rolls around in my mind all the time – how to have a blogger gathering based around cooking. I’m glad you enjoyed the post. Cooking with Lonni was really a treat – she is so emotionally and physically involved in her cooking. I like my challah a little less eggy too, and this looks perfect, Beth. What a gorgeous photo of the bread, and I loved seeing the photos of your family! Thanks Susan! 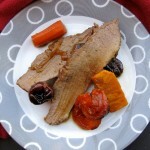 I’m excited to go read your post over on Eating Rules for October Unprocessed! I’m so glad you mentioned this, Beth! I thought Andrew was posting it at 1PM, not 1AM, and scheduled my corresponding blog post for THAT time. I just changed it. Thank you!! And you Hannah! And may it bring an opportunity for you and I to finally meet and cook in person!!! What a wonderful post, Beth. So thrilling to see you overcoming your yeast demons, and what a wonderful couple of mentors to guide you. That bread looks absolutely stunning, and has me really want to give it a try. Lonni is a force of nature and her challahs are simply stunning. She brought 4 of her beauties to Rosh Hashanah dinner – we are still devouring the final crumbs. Looked like your weekend was fantastic – I hope you didn’t give all my inside stories away in one sitting! Such a marvelous post! I adore family stories that are food centered. 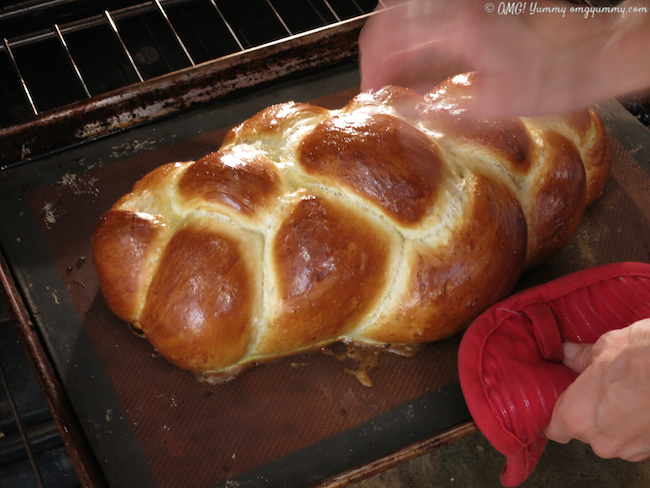 The Challah is so luxurious, bursting with fresh homemade bread flavor and history. I only knew my paternal grandmother and really didn’t spend much time with her. 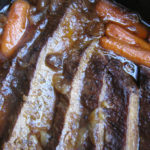 I relished reading your family history rich in tradition and wonderful food! 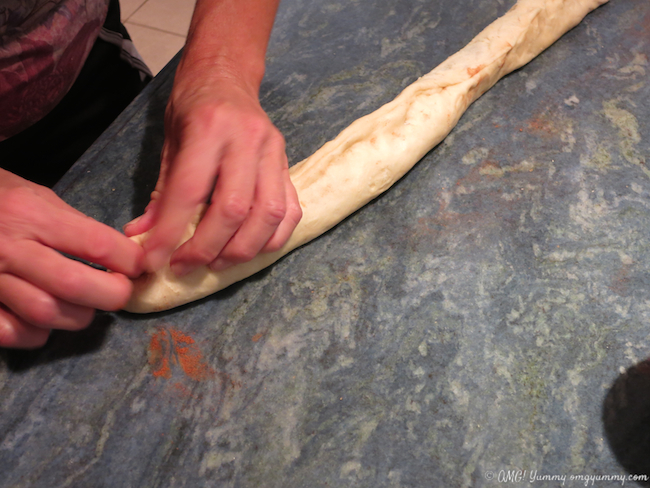 Yes – bread and certainly challah is rich with stories and tradition. 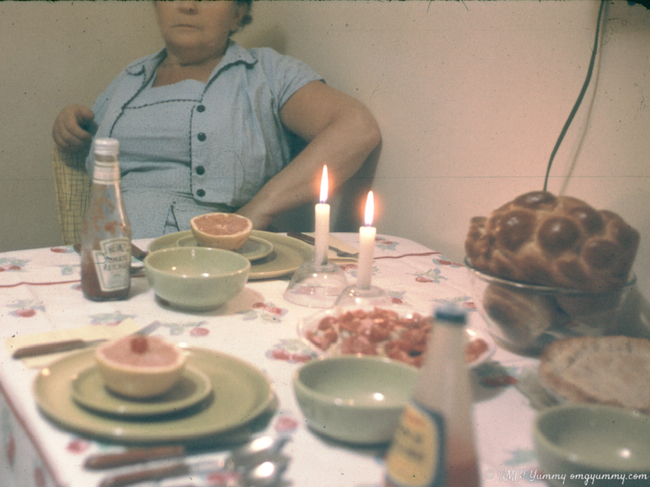 And isn’t it amazing how much history you can get from just one old slide – the food and dishes on the table with my grandmother’s challah is just so time-stamped! Beautiful story. Every time you make challah from here on out you’ll have your two challah muses guiding your hands. How wonderful is that! Thanks Sarene – and I’m sure they’ll be “amused” at my kneading but eventually impressed. Sweet story, Beth. Such a heartfelt post! Thanks Carol! I made babka this weekend, which is almost like challah with chocolate — I think the yeast demons are slowly fading away! bring back memories. Great writing and great story. Found the photo in the old slides! Lots of more good ones to come! Glad you liked the post.